The purpose of our Sangha is to serve as a place for us to explore what such a truth might look like, feel like, and mean for each of us. 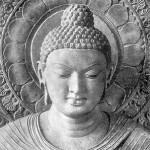 During the past year, the BSBC has explored a variety of sources of Buddha’s teachings. 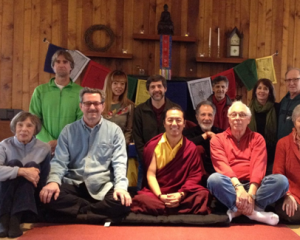 Working together, we have offered real resources to all who have joined us through meditation practice, dharma discussions, and opportunities for compassionate service. We have studied the Buddha’s teachings and related practices and traditions through visiting teachers, the book group hosted by board member Edna Telep, and weekly discussions. We have continued to explore Shantideva’s poem “A GUIDE TO THE BODHISATTVA’S WAY OF LIFE,” with the able assistance of John Wenz, and return frequently to the fundamentals of meditation. We also were blessed to have visits in the spring and fall from our Tibetan teacher, and special friend, Lama Gursam, which included both dharma talks and one-day retreats. We deepened our relationship with the Princeton Buddhist Meditation Group through visits by Beverly Sanford and her teacher, Ani Trime. A number of Sangha members attended teachings by Anam Thubten, the spiritual director of the Dharmata Foundation, and as well as a retreat and classes offered by the Princeton group. Our meditation period was strengthened by new members leading the service, and energized by additional Pali chants led by vice-president, Dave Mermelstein, who also assisted me throughout the year in organizing and leading our discussion period, with increased attendance at both. 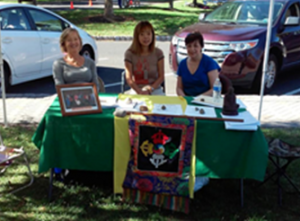 We began to have more frequent contact with the Buddhist Sangha of South Jersey through the active participation of new Sangha member, David Clark, who helped export our August Gratefulness Challenge month to include their members. In September, the Sangha organized a field trip to the Bucks County Aikido Dojo, where we practiced Zazen together, witnessed an intense Aikido body arts session, and had a Q & A session with Sensei George Lyons. The BSBC bylaws, which govern us as a non-profit service organization, were updated by the board to reflect more accurately how we operate. Three new standing committees were added to the bylaws to create a clearer structure: Program, Outreach, and Communications. Of special note this year, we held a thank-you and goodbye party for Jim Hild, who moved to the Cape Cod area this summer. 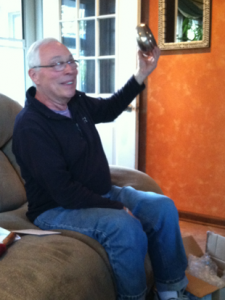 Jim joined the Sangha early in its life; served as President, Vice-President, and Treasurer at different points; was a great support to our founder James Reis; and rarely missed a Monday night service. I am personally grateful for his assistance in mentoring me before he left. We’re glad he has already been back to visit and is always welcome! This year we have added to our Sangha service and discussion amenities by reorganizing our storage area, thanks to the work of board members Lou Procaccino and Gil Howard. Also, our shrine area has a new look, thanks to ideas and work of Lou and board members Rika Barrett and Susan Harrison. We have continued our outreach and service activities through contributions to the Bucks County protective shelter, and through board member Marilynn Picciotti’s efforts, have reached out to assist homeless persons on the street in nearby communities. We continued our commitment to participate in the development of the Family Promise program, which will work with the homeless and low-income families to achieve sustainable independence. And we have continued to participate in Pennsylvania’s road clean-up program, collecting trash along our designated highway in Levittown, PA, organized by Rika. We made others aware of our presence by having tables at two community events, the annual Yardley Friends arts and crafts market and at the Button Park Peace Fair in Yardley. We brought awareness of Buddhist teachings through four invited columns in the Bucks County Courier Times, From a Faith Perspective, written by board member and Treasurer, Edna Telep, and myself. We are grateful to board members Susan Harrison and Eugene Pevzner for continuing to upgrade our communications and social media presence, which include a more informative weekly BSBC e-newsletter listing coming events and special short articles, an enhanced website, and Facebook page. One result of their efforts is shown by the approximately 80 newcomers who have attended Monday night services this year. Louise Wile, our Librarian, has updated our lending library that provides many Buddhist books, periodicals, DVDs, tapes, and audio books. 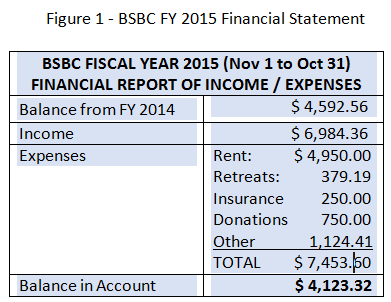 Financially we ended the year (Nov 2015) with a balance of $4,123.32 as seen in Figure 1. These expenses included $4,950 for our rent for the year based on $90 per Monday evening and special events at the Meeting House. We look to the coming year to continue the growth of our Sangha, experiencing mindfulness, and welcoming speakers to further our understanding of Buddhist teachings while supporting the practice of our members and visitors. All are truly welcome. I am grateful for the opportunity to be of service to the BSBC, which has added depth, meaning, as well as interesting and surprising people to my life.